US equity indexes closed moderately mixed, sp -1pt @ 2125. The two leaders - Trans/R2K, settled lower by -0.2% and -0.1% respectively. 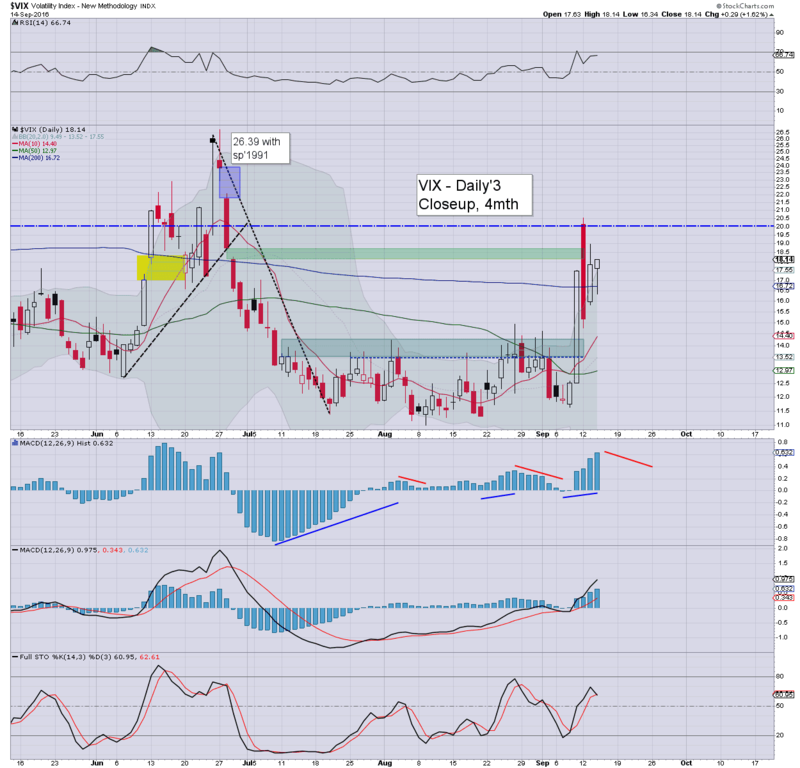 VIX settled +1.6% @ 18.14. Near term outlook offers the 2150s ahead of the weekend. Clearly, the 2200s are out of range until after the FOMC. Today was a lot less exciting, as price action is becoming more subdued, with the market another day closer to the FOMC. With a test of the 2119/20 floor in the closing hour, we now have a short term triple floor of sp'2119/20/19, and that will likely hold into next week's rate decision. I do recognise the threat of another push lower - regardless of a hike or not, but I sure don't expect price action in the sp'2050s or lower. 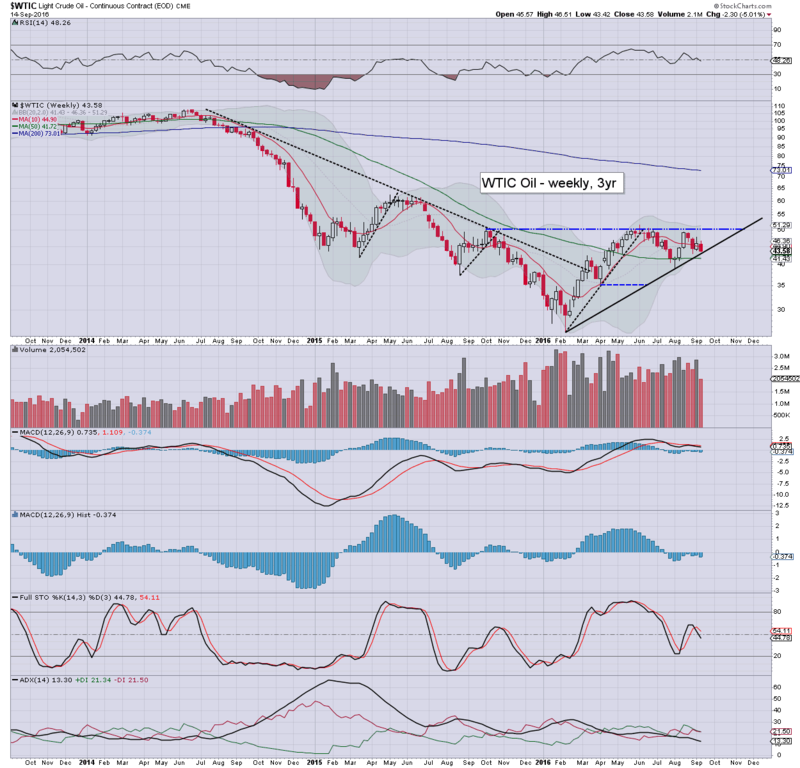 Oil has continued to broadly cool since last week's high of $47.75, settling -$1.32 (2.9%) @ $43.58. Short term price structure is threatening a move to the 42/40 zone.. before pushing upward into October. I'm still of the view that we'll break back above the psy' level of $50. 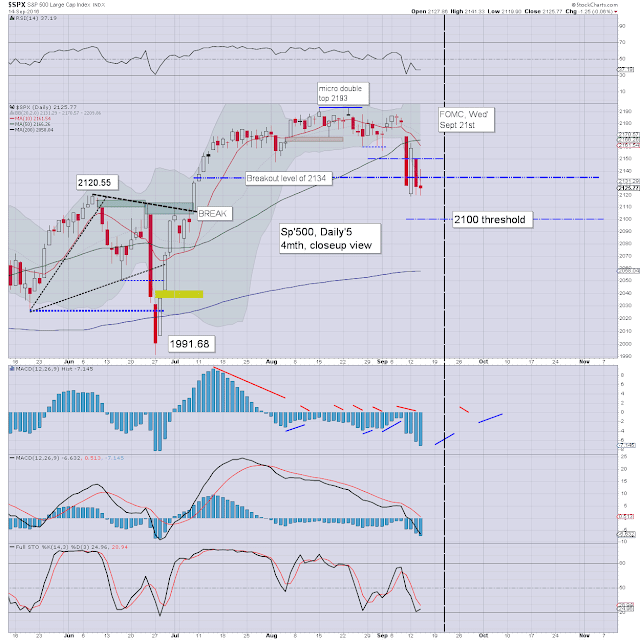 If correct, that would unquestionably help kick the equity market higher into the 2200s and beyond. I will conclude by noting, I've no doubt that if oil is trading in the $60/70s in 2017, the cheerleaders on clown finance TV will tout it as a good thing for the US consumer.